Dr. Lepera told Natalie that Boss needed surgery. But, Natalie said, “I didn’t have the money for it.” She was a student at Orange Coast College at the time and was not working. Her husband was working but did not make much money. Dr. Lepera gave Natalie a list of organizations that might be willing to help. One of them was Angel Fund. Both the hospital and Angel Fund contributed $500 for the surgery. Boss stayed at the hospital overnight and had the surgery the next morning. And Natalie is grateful to both the hospital and Angel Fund. Today, Natalie is single and works as a customer service representative in Costa Mesa. eH When she is not on the job, she and Boss are constant companions. And, as a reminder of what happened in January, 2013, she keeps that bladder stone in a plastic container. About three years ago, Sherrill Cook adopted a Saint Bernard. Her four sons welcomed Teddy to the family – but he was Sherrill’s dog. 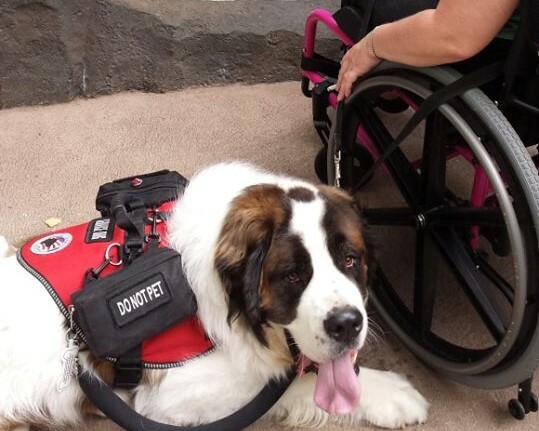 She is largely confined to a wheelchair and he is a service animal. “He pulls my wheelchair. If I am standing and start to fall, he will push me up against something and brace me all on his own. Teddy is tuned in to my heart rate and talks to me when it gets up to 120.” How does he do that? “I don’t know. I had an asthma attack once and they couldn’t get my heart rate under control. It was sky-rocketing and they sent me home anyway. Teddy just sat there and talked to me.” Can he see a physical change? “I think he can sense it. He’s really in tune with me. He knows when something is off. He is alert to an anxiety attack. And he wears a harness that I can use for balance. Jeremy Cook is a computer engineer. But the family was “living paycheck to paycheck and we were really short of money at the time of the surgery, Sherrill said. The Cooks applied for help from Angel Fund. “It worked really well. We’ve just been really blessed,” she said. Angel Fund contributed $500 to Teddy’s bill and so did the hospital. Teddy was in the hospital four days and then had to be confined to a kennel at the Cooks’ home for eight weeks. Then he resumed his duties as Sherrill chief companion and helpmate. 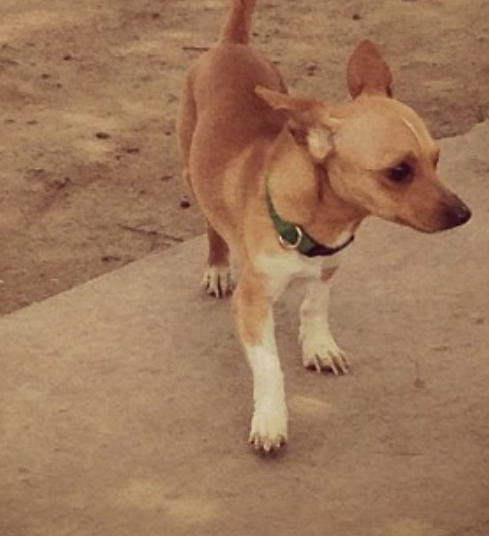 But Teddy, who just turned four, “blew out his other knee chasing a cat in the backyard” and needs surgery again. This time, Sherrill said, she will pay for the operation with funds from an inheritance she is getting from her late father. She will get around, in the meantime, with help from her husband and sons. 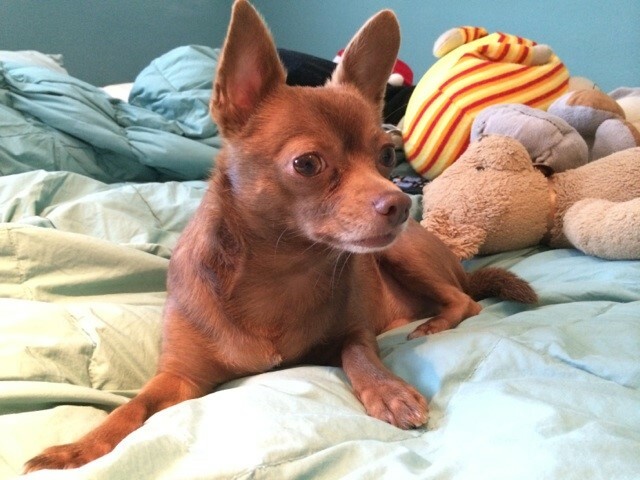 One day in December, 2013, an elderly woman brought her Chihuahua, Hershey into Laguna Hills Animal Hospital. She tearfully told veterinary assistant Taryn Collins that she wanted to put the dog down. “She didn’t think the medications that had been prescribed for him were giving him any relief from the allergies and anxiety we thought he had,” Taryn said. “ She felt that he was irritable at night and not able to sleep. She was hysterical and said that he should be euthanized right now. She thought that there was nothing else that she could do and she didn’t have a lot of funds. But she really loved her pet. “I was the first one [at the hospital] to have contact with her and escorted her into the examination room so it was definitely personal for me. I decided that I was going to fight the idea of euthanizing. So I offered the suggestion that we take the pet,” she said. Taryn set out to raise money for the surgery. Clients of the hospital contributed $200 after they heard the story. She contacted mobile surgeon Paul Cechner through Dr. Bernadine Cruz and “asked if he would do us a big favor. It was the holiday season and he did what is normally a $3,500 operation, I think, for $1,000.” Angel Fund contributed $500 and the hospital added more than $600. After the surgery, Taryn took Hershey home with her to recover. And, after six rewarding years at Laguna Hills Hospital, Taryn was allergic to cats. “I wanted to learn everything and do everything and work with animals. But I just can’t work with cats. So I planned to drive to Pennsylvania to a new job in a physician’s office. And Taryn, too, is happy. She is now helping people instead of animals and enjoying her new job. Dr. Alice Villalobos presented the Cortese-Lippincott award to Dr. Sheldon Altman in January, 2014 at the Southern California Veterinary Medical Association’s officer installation dinner. In her presentation, Dr. Villalobos noted that Dr. Altman grew up on a feed lot farm outside of Denver. She has always felt bonded to Dr. Altman because they led parallel careers during the 70’s and 80’s. Shelley introduced acupunture while she pioneered oncology services for companion animals in So. California and both spoke widely about their passions. When Dr. Altman retired in 1989 he continued to keep a hand in the profession. Instead of retirement gifts, Dr. Altman requested donations go to helping to pay veterinary bills for animals of families that needed help via the Rainbow Bridge Fund. The AHF administers the Rainbow Bridge Fund which has helped about 20 animals a year. Dr. Altman sets a magnificent example for retiring baby boomer veterinarians stay connected to our wonderful profession in some way. Dr. Altman was born and raised in Denver, CO, received his BS degree in Biological Science and his DVM degree from Colorado State University. He has been a licensed veterinarian in Kansas, Colorado and California. Prior to retirement in 1998, his professional career spanned almost 38 years. He worked for the U.S. Dept of Agriculture, served in the U.S. Army Veterinary Corps, practices veterinary medicine in Southern California, spent 2 years as a staff member of the Acupuncture Research Project UCLA Pain Control Unit, was Director of Research for the National Association for Veterinary Acupuncture and served on the teaching faculties of the Center for Chinese Medicine and the International Veterinary Acupuncture Society. Dr. Altman has referred and written articles for several veterinary journals, authored chapters in several veterinary medical textbooks and has been an invited lecturer at many local, national and international veterinary meetings, seminars and convention. He has served on committees and been a member or a board member of the Southern California Veterinary Medical Association, the California Veterinary Medical Association, the American Veterinary Medical Association, the International Veterinary Acupuncture Society, the American Academy of Veterinary Acupuncture, the Colorado State University Alumni Association, American Veterinarians for Israel and the Animal Health Foundation of California. Dr. Altman has been married for over 50 years, has three children and four grandchildren. In his retirement, he tutors elementary school children in reading, paints and plays classical guitar (but not very well). Jim Henderson is a Torrance-based “lawn doctor” who aerates and dethatches lawns. He’s also a cat lover. Some 18 years ago, the two interests came together. But Critter had a wonderful disposition and the two became fast friends. “His attitude was so great and he was so lovable. He was a lover boy,” Henderson said. “My business has not been good for a long time and I haven’t had the funds to take my cats to the vet like I used to. I used to be able to spend thousands of dollars on my cats and it wasn’t a problem. It was great for my heart. But right now it’s a problem: do I want to pay my rent or take my cat to the hospital? 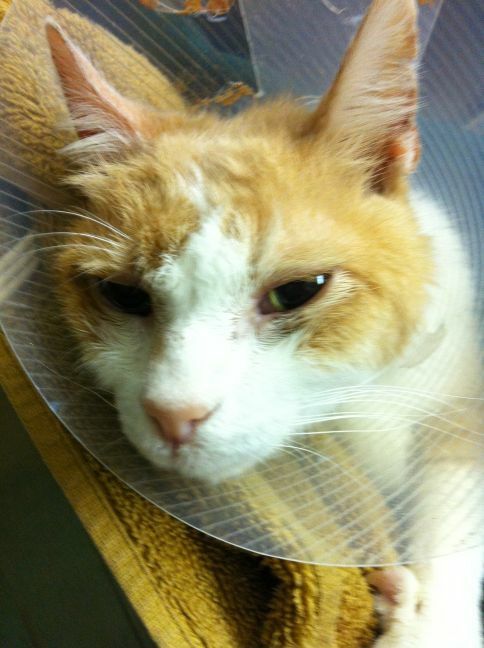 The staff at Crenshaw Animal Hospital and Cat Clinic suggested seeking help from Angel Fund. And a grant was quickly arranged. The fund contributed $500 and so did the hospital. After the surgery, Critter soon recovered. But he lived indoors and no longer spent much time outside, Henderson said. “He got around pretty good on three legs and then all of sudden one day he got real sick” and had to be put down. But the surgery – and Angel Fund – had added more than a year to his life.